Recent advancements in interventional imaging equipment and procedures are providing new cutting-edge design opportunities for interventional radiology departments. 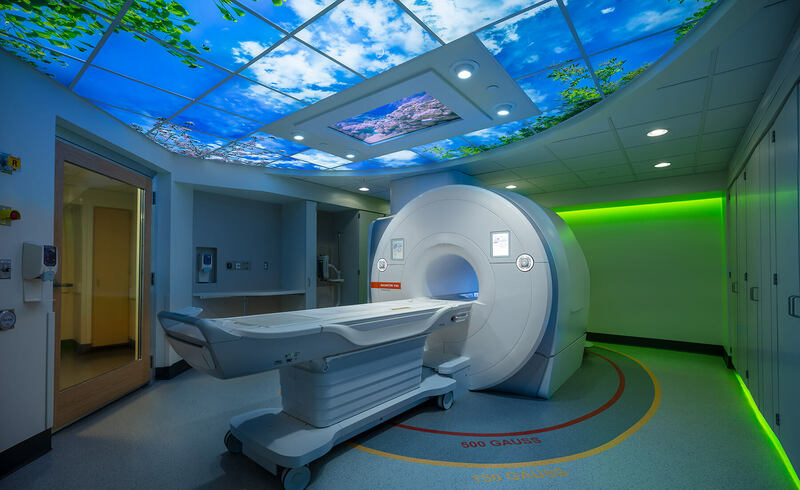 Working with Massachusetts General Hospital (MGH), we recently completed a renovation project for a new MRI room that utilizes innovative design techniques to respond to this evolving clinical landscape. The result was a seamless integration of equipment and architecture that works to the overall benefit of the patient’s experience. To coordinate design, construction, installation and operations, we led a highly collaborative process with MGH’s Planning & Construction Department and Interventional Radiology Department. For this project, the MRI had to be lifted up six floors which is not typical (MRI’s are usually no higher than three floors). This is very challenging since the MRI machine weighs roughly 20,000 pounds. In addition, the MGH building sits a few feet away from an adjacent structure on the MGH campus, so it was a tight fit. Watch the carefully orchestrated installation of the MRI to sixth floor MRI Room at MGH.